Mitchell Levy is one of the most connected people in Silicon Valley. And for good reason – he provides great value to everyone he comes in contact with. He constantly challenges friends and colleagues to stretch and do more/better. He is also always challenging himself to do better in his own business. He thinks of his own new ideas and accepts ideas from others in how to leverage the current capabilities of the company he has built in order to expand into new areas, always areas that provide new and unique value to customers. These new areas are always challenging to implement, but through smart planning, connections, hard work, use of existing assets and perseverance Mitchell almost invariably succeeds. 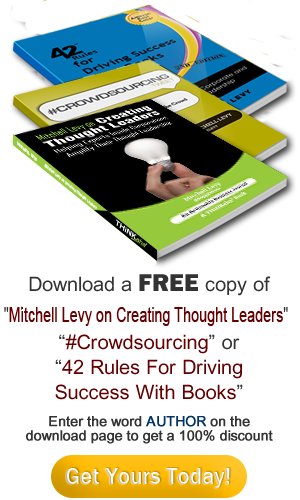 If you want to be part of a successful endeavor, I recommend that you get involved with Mitchell Levy. Mitchell is like a publishing energy bar – a whole bunch of things that are good for you all wrapped up in a healthy package. As your personal publisher, he brings out your best as an author. He handles your work with care in getting it to market, as if you were his only project. He helps you position your self and work for the best possible outcome. And, all the while, you are having a good time! I’m working on Book #3! Thanks Mitchell! Mitchell is an incredibly supportive publisher. He is always there to help you flesh out ideas for books and related learning and educational materials.He has inspired me to create business books that inspire others. Working with Mitchell on my first book project was a great experience. The insight, tools, processes, and support he and his team provided enabled me to complete the project in a reasonable amount of time and has inspired me to perhaps do it again. Mitchell was a great working partner, and I would look forward to working with him again. Working with Mitchell and his team is a joy. He’s a smart marketer and he allows his authors the freedom to do what they do best and doesn’t get in the way of the creative process. I’ve published 4 books with Happy About and look forward to many more. Mitchell is awesome on many fronts but if there is one thing that stands out, that will be the combination of sharp intellect + trustworthiness. I never have to doubt on whether he has thought about all parties involved in the deal because with Mitchell, it always will be a WIN-WIN deal. I worked with Mitchell in putting together the #Presentation Tweet book as well as some webinars for mutual clients. He is passionate and enthusiastic in everything he does and has a high level of integrity in all his working relationships. It’s been a joy being associated with Mitch and the team at THiNKaha. Mitchell has been my guide through the publishing world, enabling me to write & publish my first solo business book (and, since, a second co-authored book plus a third co-authored book for which we just submitted our manuscript). Mitchell has a great understanding of traditional publishing and has created a terrific niche for helping experts become gurus. His process and team are top-notch – and serve to build the best content in a terrific form for any first-time author. Mitchell has become a friend, as well, reflecting our values-alignment and joy of working together. S. Chris Edmonds – Speaker, author, executive consultant with own firm & the Ken Blanchard Companies. @JonesAndRaine band member. Mitchell exemplifies Silicon Valley purpose, enthusiasm, and drive in the commercial, education, and non-profit worlds. He moves effortlessly across these spheres and finds synergy that results in wins for all organizations. I have worked with Mitchell at San Jose State, his company Happy About, Foothill De Anza Community College District, and Open Doors Group / College Open Textbooks. He motivates our Senior Managers and other staff to stretch and grow. Nobody is better at getting everyone to specify in advance the ideal outcome of an event, meeting, or initiative. Mitchell has very high integrity, always delivering on his commitments. He is a consummate networker who creates high-quality mutually-beneficial relationships. I strongly endorse Mitchell for leadership roles in any context. Mitchell is a great CEO of Happy About to work for. He is a super organized and well connected in the Bay area. I count myself very fortunate to work for him. I worked with Mitchell on two different books doing multiple versions. Mitchell has served as a mentor and friend to me over the years. He helped me become a better speaker by giving me excellent and candid advice. I appreciate his ability to narrow down on changes that I can make to be better at my job(s). If you develop a relationship with Mitchell you will find him to be honest, thoughtful, sincere and knowledgeable. He is a leader who goes out of his way to help. What more could you want in a professional relationship? Mitchell made writing my first book an exciting and rewarding experience. His publishing process offers enormous flexibility and realistic timelines. I never felt stressed during the editing stage and always appreciated Mitchell’s positive words and supportive style. I can’t wait to work with him again! MItchell is a great guy to work with, one can talk to him and he really listens. As a bonus, he is very smart and fair in his business dealings. After reviewing Bill Vick’s website, I was motivated to purchase the LinkedIn Recruiting book from publisher Happy About. During the purchase process, I experienced an issue that prompted me to write the company. Imagine my surprise when 30 mins later, Mitchell contacted me directly to make sure the problem was resolved beyond my expectations. What more can say when the CEO is this committed to a positive customer experience! Simply put “true customer service”. I highly recommend Mitchell! Once again thank you – Mitchell.